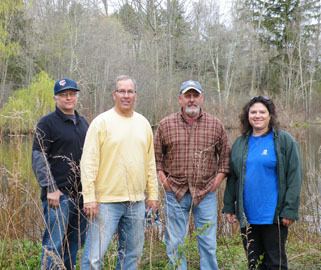 ALCOA-Howmet volunteers Dave Tommasso, Dan Fiasconaro, Gary Sala and Tracie White. Not shown, Larry Golembieski. The 26-acre Lucy T. Hammer Woodlands and the abutting 11-acre Sliney Family tract provide a lovely natural retreat near Branford’s town center. On May 2, employees of ALCOA-Howmet spent a morning with the Land Trust’s Bill Horne and Chad Lyons doing some spring maintenance. They completed the clearing of brush and fallen branches along the fence at the meadow’s edge begun by two earlier work parties, cut vegetation growing on the top of the dam, and removed some invasive burning bush (Euonymus) along the ridge trail. Special thanks to Gary Sala, Dan Fiasconaro, Larry Golembieski, Dave Tommasso and Tracie White for their help. 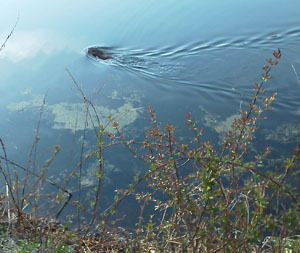 Earlier that morning, an otter was spotted swimming and diving in the pond. Even in the highly developed Mill Creek watershed on the west side of Branford, Hammer Woodlands and the Sliney Family tract provide important habitat that attracts uncommon wildlife. People walking the preserve’s trails never know what they might see. If you visit the Hammer Woodlands this month, keep an eye out for wildflowers. This is the season for the spring ephemerals, several species of wildflowers that bloom for only a short time before the trees fully leaf out and keep the sun from reaching the forest floor. 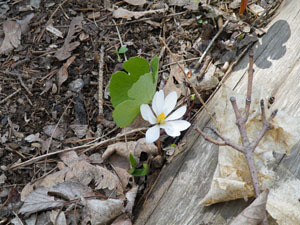 Bloodroot has been blooming along the trail near the entrance from Cherry Hill Road.